Custom file naming format - customize things like date format, field order, etc. Select file format for saving messages. Configure actions to perform after saving messages. Filter what messages to save. Template For File And Subfolder Naming for flexible configuration which should support any naming requirements you might have and match your organization naming conventions. MessageSave always sets the “Date Modified” field on saved files to the time when the corresponding message was received. You can click on the “Date Modified” header in File Explorer to sort saved messages in chronological order. A set of checkboxes to add various message attributes to the file name and to optionally select one level subfolder structure. If you need more flexibility or an ability to change field order, please use the “Template” method below. Enable this option to include the name of the person who sent the message in the name of the file. For example, if the sender name is John Smith and the message subject is meeting the generated file name would be John Smith - meeting.msg. Enable this option to include the email address of the person who sent the message in the name of the file. Enable this option to include the “message received” date in the name of the file. Date is formatted as YYYY-MM-DD. If you would like to use a different format, you can configure it using Template For File And Subfolder Naming. Enable this option to include the “message received” time in the name of the file. Time is formatted as hh-mm-ss. If you would like to use a different format, you can configure it using the Template For File And Subfolder Naming. Enable this option to include names of message recipients in the name of the file. If you would like to control how recipients are formatted (Names vs Emails, All vs “To” only), you can do so using the Template For File And Subfolder Naming. Subfolder naming controls how MessageSave generates folder names for the saved files. Here you can check only one option. If you would like more flexibility in subfolder naming, please use the Template For File And Subfolder Naming. Use message recipient names as a subfolder name. 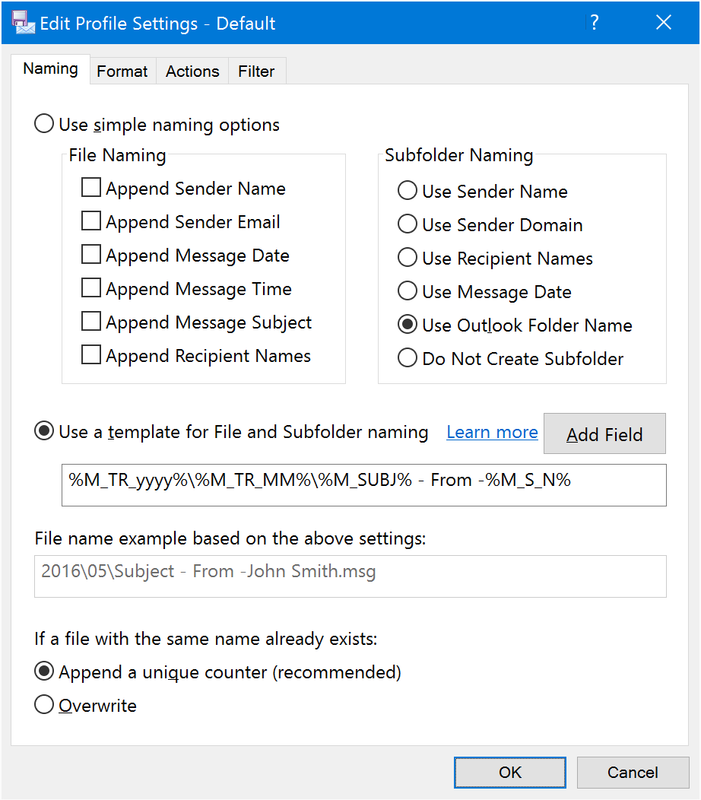 Use sender domain name as the subfolder name. For example, techhit.com\meeting.msg. Use Message Date as the subfolder name. Date format is YYYY-MM-DD. Use the Template For File And Subfolder Naming to configure a different format. Duplicate Outlook folder hierarchy in the file system. MessageSave will create the same folder tree as what you have in Outlook. Do not create subfolders. Save messages directly in the Destination Folder. Templates are a flexible mechanism for specifying file and folder naming. A name template consists of fields, which are replaced with values from the messages you are saving. For example, %M_SUBJ% is replaced with a message subject. Use the Add Field button to insert fields. You can also manually type additional values, such as separators. See File Name Templates for details on template syntax. Use this button to insert template fields from the menu it provides. Displays a sample file name, based on what you have configured above. If this option is OFF, MessageSave will generate unique file name whenever you try to save a message and a file with the same name already exists. For example, the first time you try to save a message which maps to John Smith - meeting.msg, that is the name that is used. The second time, the file will be named John Smith - meeting - 1.msg. After that, John Smith - meeting - 2.msg, and so on. If you enable this option, MessageSave will NOT generate a unique name by appending a counter. In the example above, if a file with the name John Smith - meeting.msg already existed in the destination folder, MessageSave would overwrite it with the new message. If you include sender name as well as date and time into the file name, and you are confident that you are unlikely to receive more than one message from the same sender within one second, you can enable this option if you are saving messages from different computers or by different users and are concerned about file duplication. Please be sure you understand this option before enabling it! 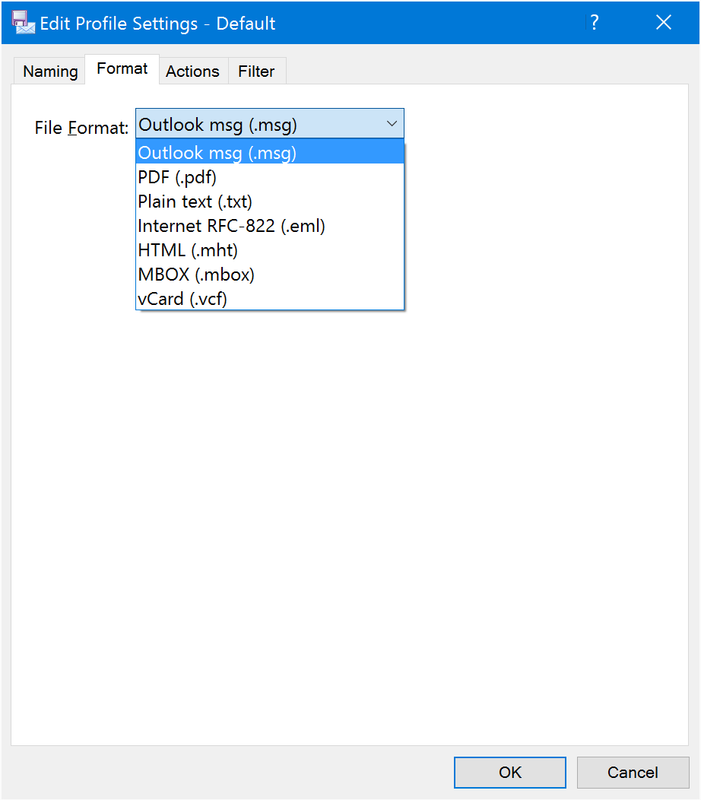 Outlook MSG (.msg) - this is the default. We recommend that you use this format unless you have a specific reason to use another format. The entire message (including any attachments) is saved in a single MSG file. When you open the message, it opens in Outlook and looks just like as if it was still in your mailbox. You can even reply or forward the message. If you are using Windows Vista, 7 or newer, built-in Windows Search does a great job of indexing MSG files and their content, including any attachments. This makes finding saved messages very easy. PDF - save messages in PDF format. Plain Text (.txt) - save messages in plain text format. Please note that plain text files do not support formatting or attachments. Internet RFC 822 (.eml) - EML format is an industry standard. Some non-Outlook email application are able to open EML files. HTML (.mht) - save messages in HTML format. MBOX (.mbox) - MBOX format is also a standard, although there are several different variations. One of the major uses of this format is migrating email from Outlook to Mac . VCARD (.vcf) - applicable only when exporting Contacts. Do not include message information header - do not add From, Date, Subject, etc. fields at the top of the PDF file. ISO 1905-01 (PDF/A) - make PDF conform to PDF/A. Include external images - fetch images linked from the email. (note recommended). Minimize file size - ommit some formattting to make file size smaller. 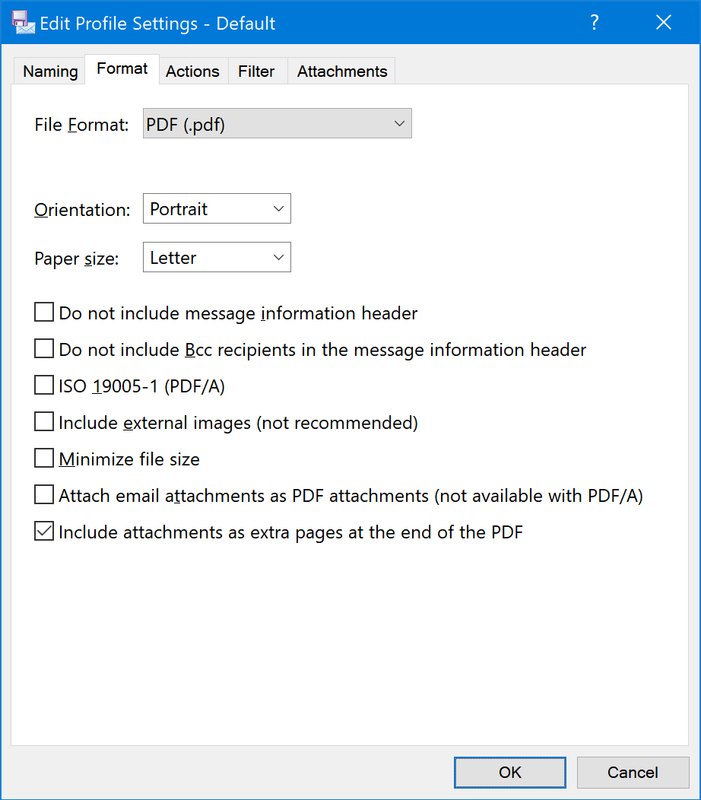 Attach email attachments as PDF attachments - attach email attachments in original format to the PDF file. Use this option to preserve the original attachments as-is. The attachments can be viewed in the Attachments Pane of Acrobat. To access it, either click a paper clip on the left of the Acrobat window or use View - Show / Hide - Navigation Panes - Attachments menu command. Include attachments as extra pages at the end of the PDF - “print” attachments as extra PDF pages after the message content. The following attachment types are supported: docx, doc, rtf, txt, xlsx, xls, pdf, pg, png, gif. Configure actions to be performed after saving messages. Mark messages as read after saving. Print messages to the default printer. MSG, PDF and TXT formats only. Note: Your default printer has to be properly configured to print files without a prompt. To test it, right click on a saved file in Windows Explorer and click Print. Remove messages from Outlook after saving them. Be careful when you enable this option. Messages are not moved to Deleted Items. They are removed permanently. 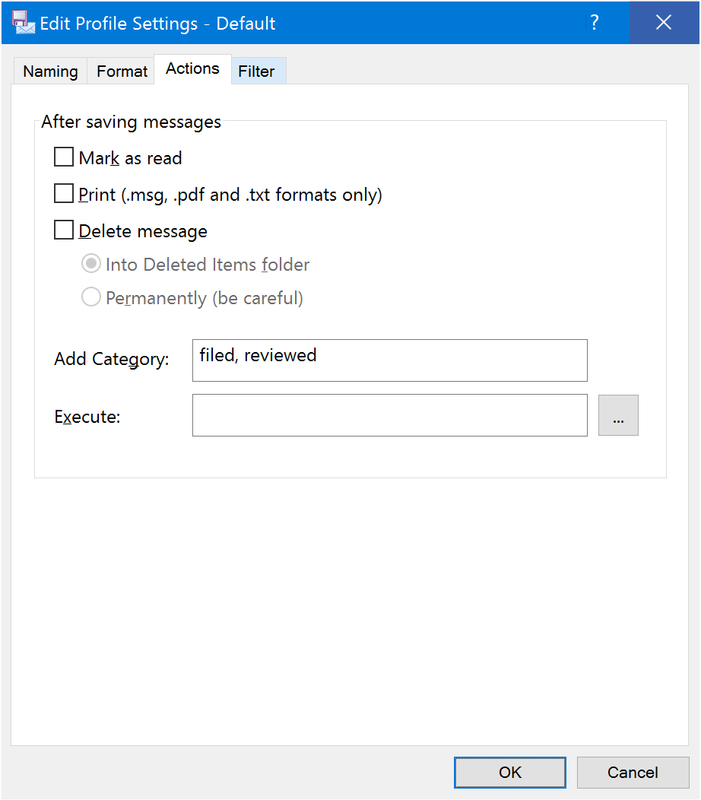 If you use the .msg format for saving (which is the default), you can still restore messages by dragging and dropping .msg files into an Outlook folder. 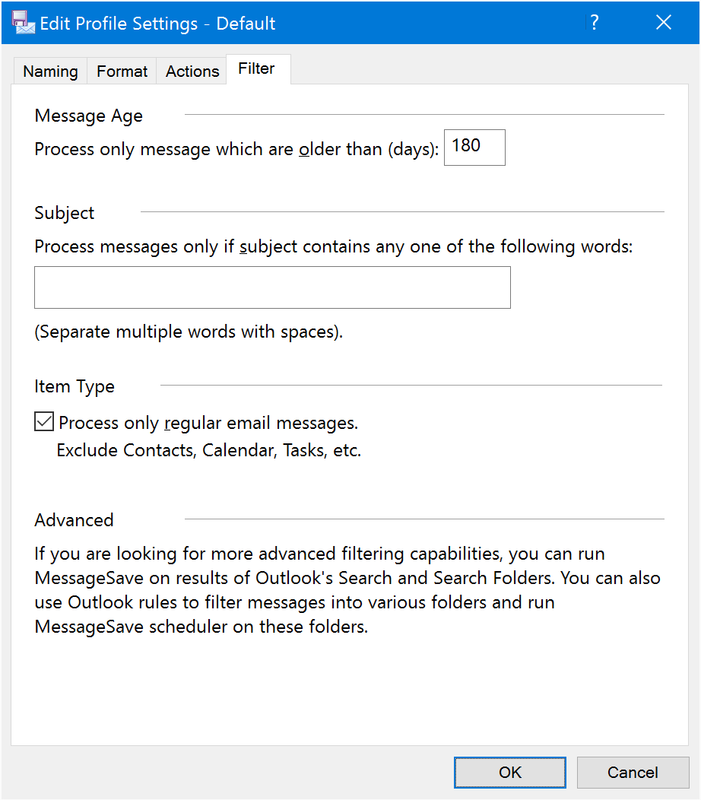 Assign an Outlook category to messages. Type category name into this field. Execute a custom script, provided by you, on the saved files. This is a very flexible option which allows you to automate email processing without having to interface with Outlook directly. Automatically process email from vendors. Import messages into a document management system. Run reports on the contents of your mailbox. See MessageSave API reference for details. Specify criteria for the messages you would like to save. Configure this option to save messages which have been received over this many days ago. You can use this option to archive older messages, optionally removing them from Outlook, and leave the most recent messages in Outlook. For example, to save messages over 6 months old, enter 180. You can use the Subject Filter to only save messages with certain words in the subject. Use multiple space-separated words to match on several topics. For example, filter sale quote will match all emails with either word sale or word quote in the subject. If you enable this option, MessageSave will save only regular email messages. Anything else, like appointments, contacts, read receipts, etc. will be skipped. If you require more advanced filtering, you can use Outlook built-in Search or Search Folders. Wait for the results to populate, then select all messages in the result set and run MessageSave on them. This integration allows you to use the full filtering power of Outlook with MessageSave saving capabilities. 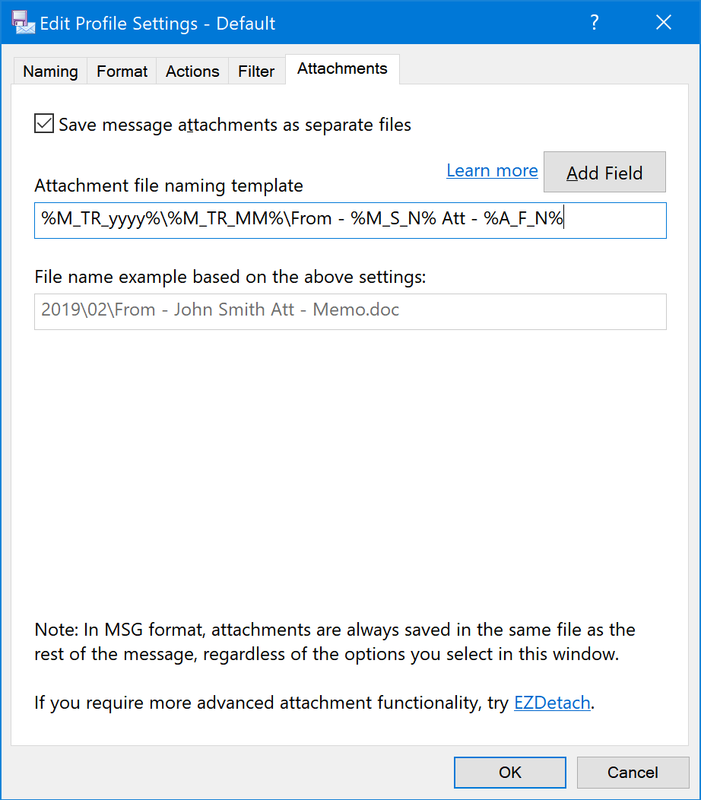 Configure whether and how to save attachments as individual separate files.